Working remotely allows the freedom to set my own schedule and to work in the environment best suited to my workflow. Some days it’s my home office, others it’s a coffee shop, and once in a while it’s on the couch with Grey’s Anatomy on in the background. This still rings mostly true; although I’ve since switched from Grey’s Anatomy to The Sopranos. However, it does brush over the downsides that can come with remote work – in my experience, distractions and losing focus. Although we mostly work in the same office at Steamclock, we do observe Work From Home Wednesdays™. It’s a special day of the week where most of the team chooses to work remotely. Based on that experience, I’d like to share my preferred approach of working from a home office, and how you can make it awesome. 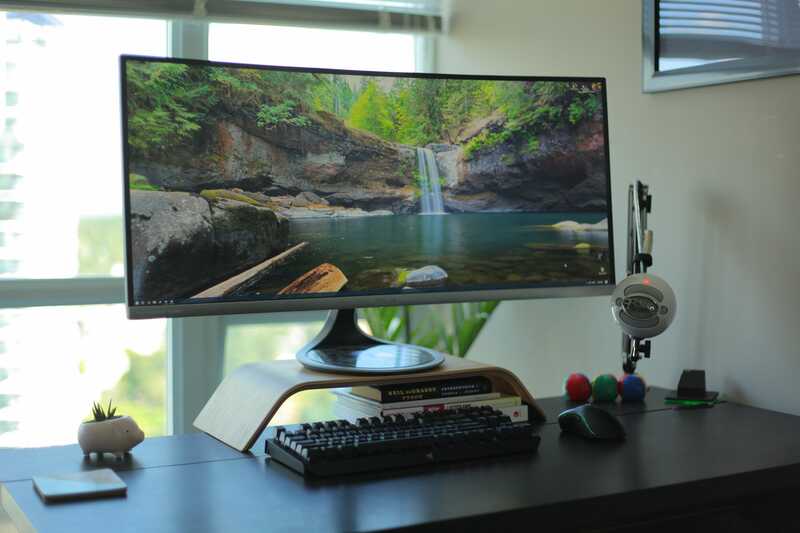 For me, my workspace should be simple, functional, and bring joy. I keep my desktop to just the basics of what’s needed to accomplish my tasks — simple and free of clutter. The cleaner your desktop is, the more space you have for the items you actually need to be productive. For example, a designer may need space for a drawing tablet, or a writer may need space for a large clickity-clacky keyboard. Many people use this as an opportunity for a photo of a loved one. For me personally, it’s some juggling balls and a cute piggy succulent planter — but feel free to choose the cute succulent planter that works for you. An obvious goal, but how should you go about it? Take a moment to name the things off the top of your head that could pull focus from your daily tasks. TV? A game console? Spouse? Pets? Lack of a Bill Lumbergh type peering over your shoulder to ensure you’re working hard? Reducing these distractions my be easier said than done, but I’ve found that noise-cancelling headphones and plenty of natural light help me stay focused on my display rather than being drawn towards the Apple TV remote or Xbox controller. There are plenty of scientific studies showing that light snacking throughout the day is better than eating several large meals at pre-determined times. While this may seem obvious for your health, it also does wonders for mental clarity. Keep it light and healthy as much as possible. Set aside the chips with soda combo, and instead reach for some fruit with water. My go-to snacks at home are mandarin oranges, or carrots with hummus. A little goes a long way. The official Pomodoro technique recommends working in bursts of 25 minutes, with a short break after each burst, and then a longer break after 4 bursts. Personally I’ve found myself to be more productive when working in bursts 45 minutes with 15 minute breaks. It will take a few tries to find the balance that works best for you, but the key thing is not to underestimate the importance of giving your mind a break. While it’s important to give yourself breaks, it can be all too easy to brush your tasks aside when surrounded by the comforts of home. Staying mindful should help you keep not just a positive headspace, but a productive one too. As fun as designing novel navigation schemes may be, there a lot of better ways to make a new app distinctive and appealing. Today we’re launching a new Mac app called Quests for tracking issues and pull requests in your menu bar. Here’s how it came to be. At Steamclock, we work on a variety of projects at once. Between client projects, open source libraries, and internal labs projects – across iOS, Android, Mac, and the web – we have quite a few repositories and issue trackers going around. We’re also fans of code review. That means team members sometimes review pull requests for projects that they’re not otherwise working on. Code review is a great way to improve quality and reduce the “bus factor” of projects, but it definitely creates more pull requests and issue traffic. As a result, our pull request and issue notification emails can get rather noisy. Each of us works across multiple repositories, and often even multiple issue trackers or source control systems. At a certain volume, issues or pull requests can get lost in the shuffle, which can really sap a team’s velocity. So, we thought it’d be nice if you could easily see the pull requests and issues assigned to you. Maybe right up there in your Mac’s menu bar. So we built that, and turns out: it is nice. We called this little app Quests. At Steamclock we love to iterate, refine, polish, and add to a product until it’s beautiful and exceptional. With Quests, we challenged ourselves instead to ship it, and then polish it to its full potential beauty. So we have plans for how we’d like Quests to look, and future subscription features that would let us add additional source control and issue tracking systems beyond GitHub.com and GitLab.com. But today, Quests is useful. Almost everybody at Steamclock uses it already. So today, Quests is available for free on the Mac App Store. If you think it could be useful to you, try it out. If it is useful to you, let us know! Last week, we launched a totally redesigned Steamclock website and branding. We think it’s neat, so here’s a bit about it. It’s easy to go overboard on value statements and brand visions. “Our mission is to optimize synergy for shareholders,” sure great – very inspiring. When it comes to doing design and branding work though, it is really helpful to lay out what the message is. What is Steamclock about? High quality, but not corporate. With these in hand, it was a lot easier to discuss proposed designs, colours, fonts, and the like. If you’re in the position of being a founder that is involved in design work, it’s super important that your team has design goals that aren’t just “the founder likes it”. The previous Steamclock logo was designed by me, back in the early days. Protip: If your CEO designed your logo, it is highly likely that there is room for improvement. 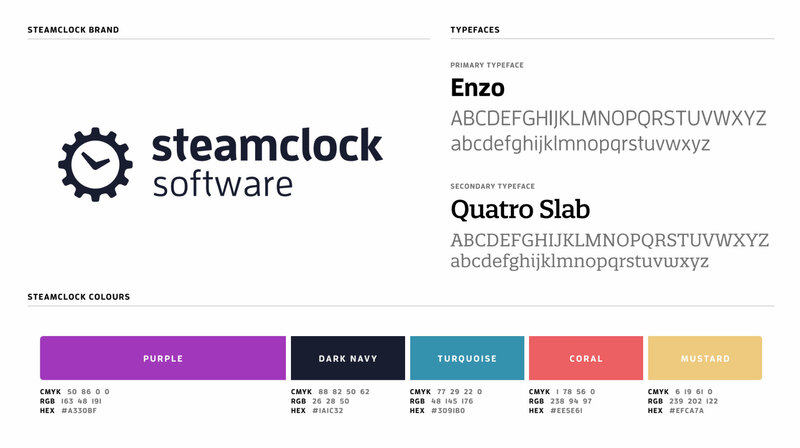 We also modernized our font choices, and picked a colour palette that felt playful and distinctive – a far cry from the corporate blue that our previous branding had slowly descended into. As it happened, we chose coral as one of our colours, which has since become an iPhone color and was just named Pantone Color of the Year 2019. We’ll need to keep an eye out that it doesn’t look “soo 2019” in a couple years, but for now we love it. Brand in hand, we filled the new site with bold colours, bold fonts, and nice illustrations. Illustration has become a big enough part of our work that it deserves its own post, but it’s proven an excellent way to communicate – without indulging my habit for excessive wordiness. We’re rather proud of how it all turned out, and all the hard work that Erica and Brady did here to design and launch it. Of course, if you have any feedback or thoughts we’d love to hear them! Once upon a time, Steamclock launched two DJ apps for iOS: WeddingDJ and Party Monster. The pitch was simple: a queue-centric flow, smooth crossfades, and an easy interface for amateur DJs. WeddingDJ was a hit with brides, grooms, and semi-pro DJs alike. Party Monster was well-loved for its opinionatedly queue-based UI, and fans enjoyed its habit of refusing to play Nickelback. Before long, these apps were paying our rent – which is a rare milestone in the indie iOS app world. Don’t get me wrong, the cloud is great. I love the cloud, some of my best friends are clouds. However, Apple’s transition from iTunes downloads to cloud-based streaming gradually hobbled this kind of DJ app. First it was iTunes in the Cloud, and iTunes Match – cool services, but they arrived without any way for apps like ours to trigger a download and make these tracks available to play. Then came the bomb: Apple Music. Not only can crossfading DJ apps like ours not download Apple Music songs, we can’t even play downloaded tracks, since they they are protected with DRM. As we wrote in 2015, this has been a pain for our users, and attracts angry and frustrated reviews. Even with app descriptions that started with all-caps “THIS APP DOES NOT WORK WITH APPLE MUSIC“, we’d get users who were upset – and reasonably so – because they’d downloaded our apps but couldn’t use them with their music. So in 2016, we rounded up the various bug reports we’d made and published a review of the various issues and limitations with the APIs for DJ apps. Essentially, we needed either improvements to the the crossfade-capable but low-level AVFoundation APIs to let them play Apple Music, or additions and fixes to the high-level MPMediaPlayer APIs to support crossfading and queueing. To their credit, Apple soon made a handful of fixes that changed Apple Music support at the MPMediaPlayer level, but 2 years later there are still multiple showstopper issues. In 2018, it is still not possible to make a nice queueing and crossfading DJ app that can play Apple Music tracks in the background, so this use case is clearly not a priority for them. In the meantime, our apps’ ratings just have just trended lower and lower. For every delighted customer who’d bought their music, we’d get one or two who had no use for a DJ app that didn’t support streaming. Even though the apps still make some revenue, we’ve reached a tipping point. Too many users are having a bad experiences, and it’s only getting worse. That’s not the kind of product we want to sell at Steamclock. 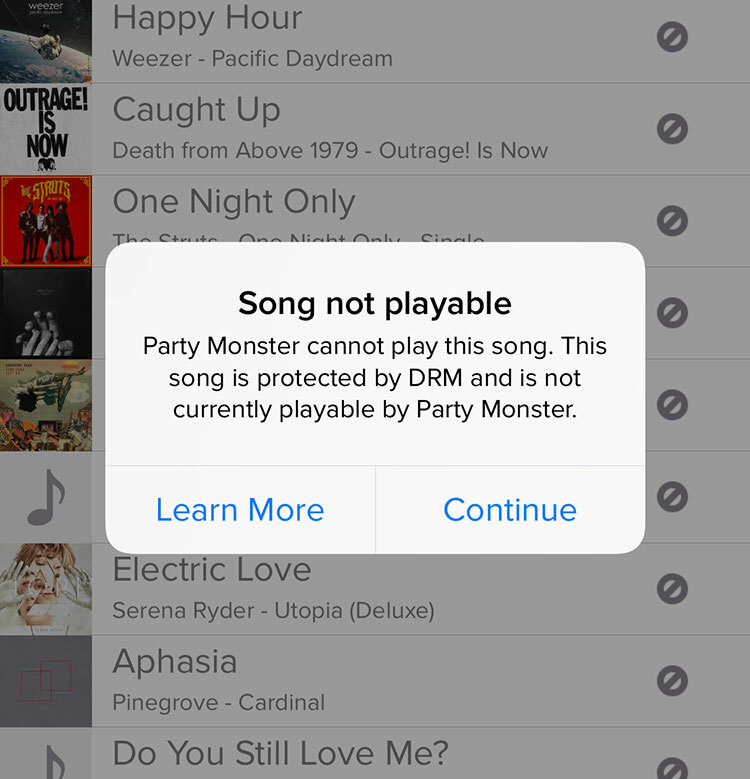 We’ve tried various avenues – filing bugs, investigating Spotify, and prototyping simple “Baby Party Monster” demos that are possible with Apple Music, but none of these paths lead to what our customers are asking for. So, the time has come to sing one last song for Party Monster and WeddingDJ. Today, we removed them from sale. The App Store should allow people who own these apps to download them indefinitely, until a future iOS update eventually breaks compatibility. It was sad, but it’s time. These apps powered more than 100,000 weddings, along with years of parties and road trips. We loved developing them, and we’re so sorry we couldn’t find a path to modernizing them. That said, we’ve learned a lot in the process, and have put those lessons into building dozens of other apps. We’ve shipped many for our clients, but in the last year we’ve been increasingly prototyping new internal apps, iterating them, and betting on ones worth shipping. This winter we’ll be shipping a Mac app for issues and pull requests, and next year we finally launch our turn-based spy game and v1.0 of our Bluejay iOS library. Of course, that’s little consolation for folks who wish a nice app for crossfading and queueing Apple Music tracks could exist. We wish it could too. And hey, people are still trying! Maybe one day it will be possible. We’ll keep an eye open – just in case.